Once again I have stumbled upon another oddly-named candy – this time it’s Fizzy Creaming Soda Candy. According to the website, it comes in ” Ruspberry and Soda Flavour”. I can only assume they meant cream soda – or maybe even creamy soda. I’m not going to try and read anything else into that name. The company that makes it, Excel/Naveed Enterprises, is based in Pakistan. Just what we need, a bunch of people saying, “Ugh, this candy creamed in my mouth.” Err… did I just write that. Ha ha ha. I want some candy to cream in my mouth ahem cough cough yeah!!!! 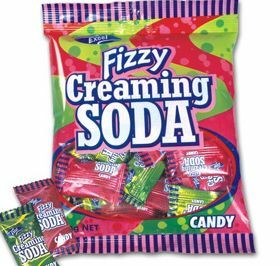 Im from New Zealand and here Cream soda is called Creaming soda and Cream Soda but is most commonly called creaming soda – so maybe its just a regional thing ? where can i find one in new york? i live in new york where can i get it?